I am currently doing a Babolat Aero Pro Drive Original Review in the “Rafa spec”. I have play-tested this racquet before, but never did a proper review and definitely not one with the same specs as Rafa uses. To start this Babolat Aero Pro Drive Original Review, I want to mention that Rafael Nadal uses the Babolat Aero Pro Drive Original and not the latest Babolat Pure Aero . He has been using this racquet since 2005 and for a pro player to change a racquet he is successful with is quite a drastic thing, which means that the racquet manufacturers paint the racquets to look like new instead. This is common on both the ATP and WTA tour. One way to spot it has been to look at the so-called “Cortex” technology above the handle. On Rafa’s racquet it has been painted to look like it’s there from afar, but if you look closely you will see that it is not. 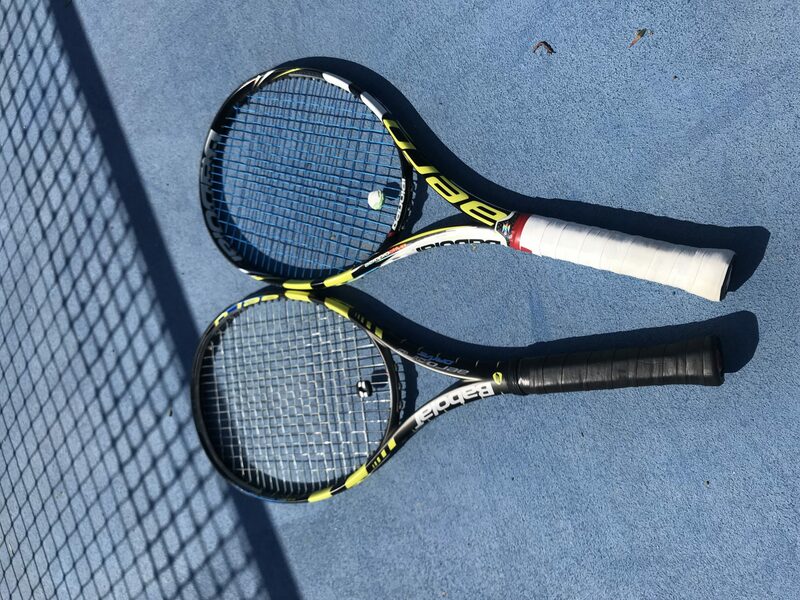 In the latest edition of the Babolat Pure Aero, the Cortex technology is moved up to the head instead, which will make it more difficult to spot. Just compare the 2013 APD GT and the Original in the pic below. the 2013 edition has Cortex technology just above the red handle tape, while the APD Original has not. 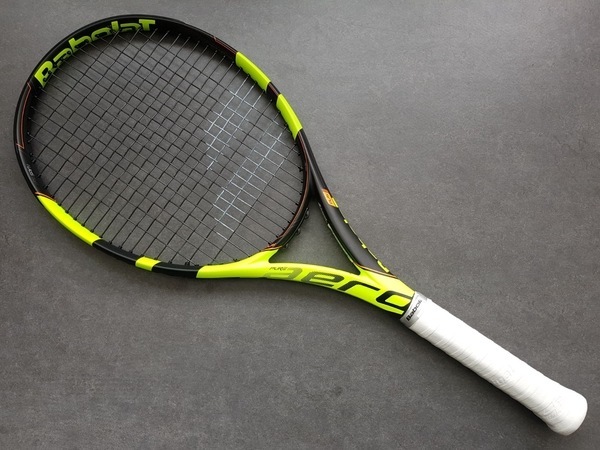 The Babolat Aero Pro Drive Original does not have any “fancy” technologies and is more or less a pure graphite construction with an Aero beam. It plays crisp and powerful, but the launch angle is significantly lower than the later versions of the Aero line. With an RA rating of 72 unstrung, it is not exactly arm-friendly and even with a hybrid of Babolat Addiction and RPM Blast , I felt a twinge in my arm after the session. This makes it difficult for me to understand how Rafa can play with a full bed of 1.35 gauge RPM Blast ! Unstrung weight: 10.6 oz. / 300 gr. – Racquet weight strung: 340 grams (including dampener and overgrip). As I wrote above, I have not yet tested the 1.35 gauge RPM Blast, but I have reached the Rafa spec using lead tape. It plays quite nice, more stability, still relatively easy to swing and more controlled than newer versions of the Aero series. Spin potential is definitely not as good as with the new Pure Aero or even the latest Pure Drive (read my review here), but I prefer a bit more controlled launch. The feel of the APD Original is more direct, a bit rawer, and not as muted as the later editions. For some that is a great thing, for others it is not. I think they have improved the comfort of the APD over the years, although it has never been a good choice for any player with arm issues. I enjoyed the crisp response on groundstrokes and felt like I could hit winners from anywhere in the court, but compared to the racquets I usually play with, I lack some precision. If you play with plenty of top-spin the lack of control might not be an issue, but for flatter hitters you need to dial up the string tension quite a bit. This in turn makes the racquet even less arm-friendly. What the added weight of the Rafa spec does is to improve the stability and power level of the racquet. If you wanted to dial down the launch angle even more and increase the twist weight, you could add weight at 3 and 9 instead. But Rafa plays with a heavily polarized setup with the idea to increase power and spin potential for his huge lasso swings. It is definitely not an impossible setup for us mere mortals to play with, but it helps if you have a spin-friendly game with a western or semi-western grip. 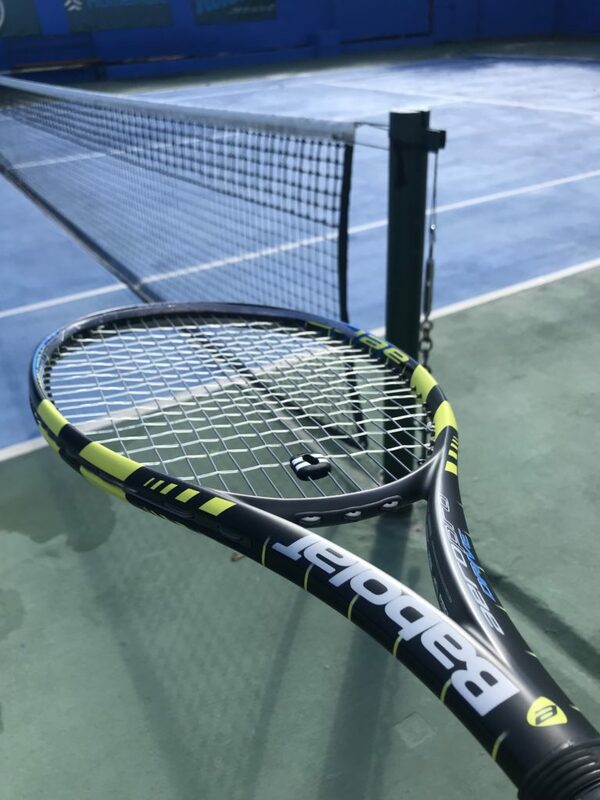 Have you tried the Babolat Aero Pro Drive Original? What do you think about it? Would you like to try the Rafa spec? Please comment below. Allegedly, Rafa’s aerodrive has a lower RA compared to stock version, something in the mid 60’s. when is the review of the yonex vcore 95 coming out? i’ve been waiting for so long since I’m thinking about buying one. Sorry, the racquet is on the way to me, but I am not sure why it is taking so long. As soon as I get it and have my first session, I will update the website with my first impressions! Yeah, it is listed on the RDC as 65 so that explains how we can use it with such a stiff string setup. 65 should be more accurate. So, same racquet has stock Aero pro Drive original, with softer layup, and weighted up with lead. Interesting to me that Nadal uses 1.35 gauge strings, I did not know that. I was using the Aerpro Drive Tour and nearly moved away from it because I couldn’t get the control I wanted. Usually I use 1.20-1.25mm strings, so as a last ditch attempt I went for the thickest string I could find (which was Solinco Tour Bite 1.35mm) and strung it quite high. Very pleased with the results and most surprisingly I do not find any significant comfort issues. I think the additional weight and thickness of the beam helps a lot to prevent vibrations from travelling up my arm. Also very stable on off-centre hits. I should probably mention that I did have to move to a more western grip from a semi-western for more control and dip to keep the ball inside the lines. Enjoying this racquet a lot at the moment. Hi folks… You should correct some information, the year of release of this model was 2004. Good post! Thanks Lucas! First I thought 2003 and then 2005, but 2004 could be on the money!